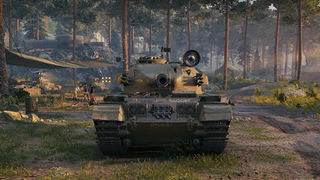 Der Centurion Action X ist ein britischer mittlerer Panzer der Stufe 10. Der Action-X-Turm sollte für einen der Centurions späterer Ausführung verwendet werden. 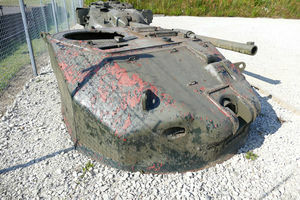 Ein Prototyp des Turmes wurde auf dem Fahrgestell des Centurion Mark 7 verbaut, ein weiterer Turm für ballistische Versuche verwendet. Die Fahrzeuge mit dem Action-X-Turm wurden weder in Serie gebaut, noch eingesetzt. Der Centurion Action X markiert das Ende seiner Linie britischer mittlerer Panzer. The Centurion Action X is a significant upgrade from the Centurion 7/1 in every aspect and a further refinement of the play style. 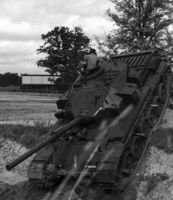 It retains the excellent gun depression and powerful L7 cannon of its predecessor, but with greatly improved mobility, greater accuracy on the move, and even better turret armor. All this combines to make a tank well suited to the hull-down style of its predecessors, but now with the option for rapid flanking and firing on the move as well. 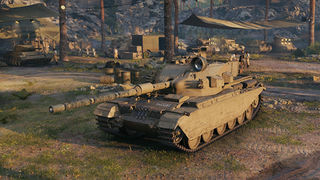 Still, the Centurion Action X does not have the armor to stand up in a prolonged fight against powerful tier 10 guns, even hull down, so making use of the upgraded speed and mobility is essential. However, while the Centurion AX's upgraded mobility can allow it to brawl if necessary, the Centurion AX is a long range fighter at heart. 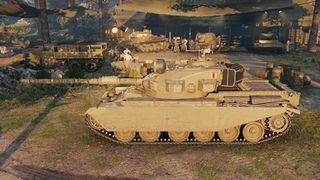 Its large size coupled with moderate DPM compared with other tier 10 mediums make brawling a dubious proposition at best. The surviving Action X Turret, used to test how well it survived oncoming fire.